Buy 9 get 1 FREE! Special Bulk Buy Offer! HOW WILL MY BABY BE HEALTHIER & HAPPIER? Choosing these Diaper Sacks shows that you care. Together, we will make sure that our PLANET will still be a LOVELY PLACE when YOUR BABY grows up. For clean, easy, ENVIRONMENTALLY FRIENDLY disposal, use with Beaming Baby Organic Wipes and Bio-Degradable Diapers. 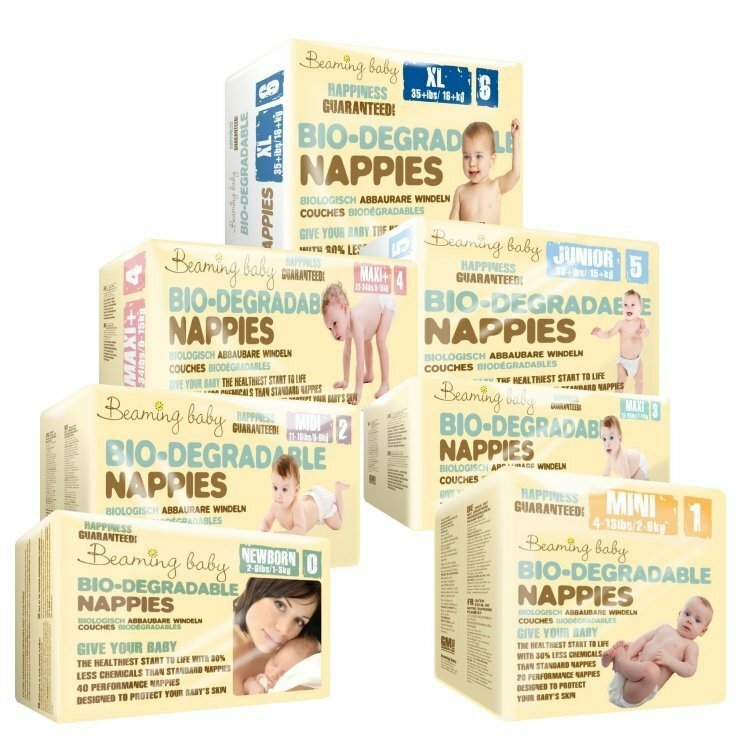 Beaming Baby BIO-DEGRADABLE and COMPOSTABLE Diaper Sacks allow for CLEAN & EASY, Environmentally-Friendly Disposal of Your ECO DIAPERS. Use with Beaming Baby Organic Baby Wipes and Bio-Degradable Diapers. This diaper sack will 100% BIO-DEGRADE in 2-5 years while standard plastic bags take around 400 years!! Our Diaper Sacks are 100% COMPOSTABLE and leave no harmful residues. They contain an additive, put into the plastic at the extrusion stage, that will make the finished product "OXO-BIODEGRADE" so that it will 100% degrade and disappear in only 2-5 years, leaving NO fragments, NO methane and NO harmful residues. I'm EASY to pull out, and the next diaper sack just POPS UP in my place.